If you like Asian or experimental cuisine, then you’re no stranger to soy sauce. And if you love eating it, then chances are that you’ve tried cooking with it a couple times. Or you’re just an expert who uses soy sauce every day and are looking to change up your habits a bit – whatever the reason you’re here, we’ll help you find the best soy sauce to go with your favorite type of rice, straight out of the rice cooker! Do you know that you can’t really cook with any type of soy sauce? Some of them are meant just for dipping, and don’t really taste that great when they are heated too much. If you didn’t know that, then there’s some other interesting things I can tell you about soy sauce, so keep reading! Did you know that there are actually three types of authentic Japanese soy sauce? Each of them has a different flavour and consistency, and is intended for a different purpose. Koikuchi soy sauce originates from the Kanto region and it has a very dark color. This is the type of soy sauce that you should use if you are following a recipe that calls for soy sauce. It has about 16% salt content, and it goes really well with meat and potato dishes. The second type is Usukuchi soy sauce, from the Kansai region. This one is really light in color, because the natural color of its ingredients is preserved. It has a 19% salt content, so it’s not that great for sweet dishes. But it goes really well with omelettes, noodles and all kinds of vegetables. Last but not least is the Tamari soy sauce, which is mainly produced in the Chubu region. And this is the soy sauce that you see most frequently in shops, online and in restaurants. It is mostly made of soybeans and a dash of wheat, with a salt content of 16%. It is dark in color and has a thick consistency, which makes it the perfect dip for your favorite sushi. Keep in mind that these are the types of traditional, Japaneese soy sauce. In the US these are usually called dark, light and thick soy sauce, respectively. It’s a common belief that soy sauce doesn’t have an expiration date. But that’s not exactly true – although it can last a really long time because of the high sodium content, it will eventually go bad. An unopened bottle of soy sauce can be stored for up to three years. And you should always store it in a cool and dry area – it doesn’t have to be the fridge, but rather a cupboard or a pantry. An opened bottle of soy sauce, on the other hand, has a shelf life of one or two years, depending on long it has been sitting there unopened. And once you open it, it is recommended that you store it in your fridge, for optimal taste. Keep in mind that it is also fine to keep soy sauce at room temperature. But, it will go bad sooner rather than later, which is why it is recommended to keep it in the fridge. There are several different ways of making soy sauce, but I will only tell you about the traditional one, as it yields the best results. Soy sauce is made from three basic ingredients – soybeans, wheat and salt. First, the soybeans are soaked in water and cooked to become softer, and then they are mashed. Wheat is usually roasted, and the two are mixed together. Then, a fermenting agent is added to the mixture – usually Aspergillus, but it can be replaced by similar types of yeasts or fungi. That mixture is then combined with a certain amount of salt brine, and left to ferment. The fermenting agents basically break down proteins into amino acids, and starch into sugar. This is also how the sauce gets its dark color and sweet taste. After fermentation, the solids need to be isolated from the liquids – traditionally, this was done by squeezing the mixture through cotton cloths, but the industrial process is much more sophisticated. The raw soy sauce is then heated, to get rid of any leftover yeasts or mold, and then it can either be aged, or packaged and directly sold. Aged soy sauce is much richer in taste, and it’s definitely not for everyone’s taste buds! This is low-sodium soy sauce, with a sodium content of 550 milligrams per serving. Regular soy sauces usually have about 1000 milligrams of sodium, so this is actually amazing. But keep in mind that your recommend daily intake of sodium is around 2000 milligrams, so don’t overdo it! This particular soy sauce goes well with vegetables, and especially with sweeter dishes since it is not too salty. It’s also not too rich in flavor, so it’s the perfect choice for people who find regular soy sauce to be too strong. But it’s also not the best one to cook meat with, so keep that in mind. This particular product actually includes a pack of 12 10-ounce bottles of La Choy Lite. You are paying about $2.5 for a single bottle which is actually a really good deal. Especially considering that you can’t find this in most stores and bulk purchasing is your best options if you use soy sauce frequently! This is the perfect soy sauce for all of you really pay attention to what you eat. 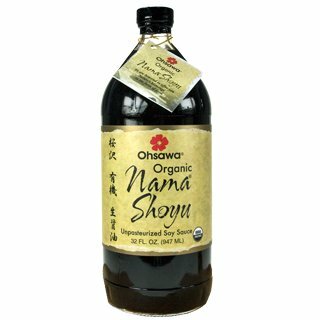 The Ohsawa Tamari soy sauce, is organic, kosher, gluten free, and it has a much lower sodium content than most other soy sauces. It is made from soybeans, water, sea salt, distilled sake and aspergillus. It is Tamari sauce, so it’s still not the best one for cooking. Instead, this is recommended as a condiment for cooked food, plus it goes incredibly well with sushi. Oh, and this is actually produced in Japan, so even though it doesn’t contain wheat, it’s the closest thing to regular soy sauce you can find. It is pretty pricey though, for a single bottle. However, the bottle is really huge – 32 ounces can last you months, maybe even a year if you use it sparingly. The only issue here is storage – since the bottle is so large, it might be a little awkward to find space for it in your fridge. But that’s where you want to keep it, if you want to preserve its rich flavor for as long as possible. Shoyu actually stands for artisan Japanese soy sauce – that’s how you know you’re getting the real deal. Kishibori Shoyu is produced in Japan, by the Takesan company on the island of Shodoshima. That part is important because this region actually produces high-quality sea salt, which is used in this shoyu. Since this is traditionally brewed soy sauce, it has numerous health benefits. Its antioxidant properties are actually stronger than those of red wine, and even Vitamin C. It is also rich in minerals, and because of that it is said to aid in digestion and even have anticancer properties. Kishibori Shoyu is fermented in barrels, which are partly responsible for its fuller flavour. And since it has zero additives, it is much milder than commercial soy sauces. 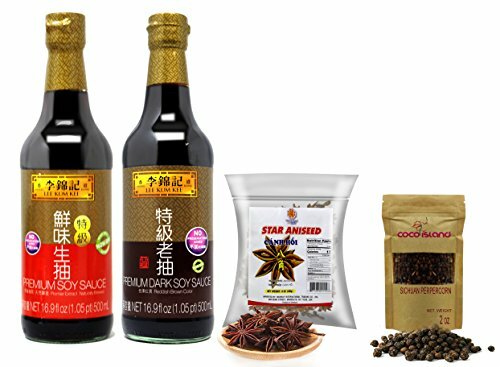 If you want a soy sauce that can enhance every single meal you make, while still being healthy and good for you, this is the perfect one for you. It comes in a 12 oz bottle, which is kind of small for the price, but it is without a doubt worth it. 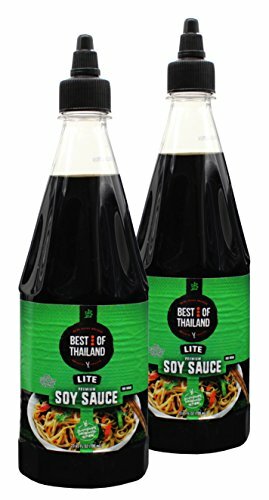 The Lite sauce by Best of Thailand is kosher, low sodium soy sauce. It actually has a sodium content of 270 milligrams per serving, which is great if you really need to be careful about your salt intake. Since this is produced in Thailand, it obviously goes great with your favorite Thai food. But, because it is somewhat sweeter than other soy sauces, it doesn’t go that great with red meat. One really useful thing about this soy sauce is that it comes in a squeezable bottle. You no longer have to pound on the glass bottle to get it to come out – and wind up with way too much soy sauce. With the Best of Thailand’s soy sauce you can easily squeeze out the perfect amount. However, keep in mind that that also means the sauce is stored in a plastic bottle, which is not too healthy. This is actually a bundle of two 24.4 ounce bottles, so you’re getting pretty good value for money. Plus they aren’t really expensive to begin with. And since you only need a couple of tablespoons for a dish, you’ll be using this soy sauce for a long time. This is another Shoyu, so it is a great choice for people who have had a taste of the real thing and looking for the next best thing. Also, this is on organic product. It is made with organic soybeans and wheat, sea salt and mountain spring water – zero additives and preservatives. Keep in mind that it’s not gluten free, though. This is a fermented soy sauce, which means that it has a pretty strong flavor. Also, it does contain less sodium than most mass produces sauces – about 720 milligrams per serving. But that’s still a lot, so you might want to avoid it if you’re not a fan of savory foods. It’s not the best one to use with sweet meals, but it goes delightfully with grilled steaks, vegetables and other savory dishes! Nama Shoyu has a pretty long shelf life, even though it’s unpasteurized. One of the bigger concerns is actually long you can keep this open, since it is a pretty large bottle. But as long as you keep it in the fridge, you’ll be fine. A little really goes a long way, and although it is pricey, you won’t have to (or want to) buy another soy sauce for months. If you’re looking for the best sauce for the sweeter dishes, I think this is the best choice. It really enhances the flavor of both spicy and sour dishes – this is actually an Indonesian product, and it is great for that type of cuisine. If you’re a fan of sweet chilli chicken, or sweet and sour pork, this is the best soy sauce for you. It is a halal product, but it’s not really organic. It does contain benzoate, which is a preservative. Other ingredients include palm sugar, soybean, salt, sodium and wheat – so obviously it’s not gluten-free. This is a pack of three bottles, each of which contains 9.2 oz of soy sauce. The bottles are actually plastic, but they are PET, which is generally considered safe to use. Just don’t reuse them, once you’ve emptied them out. At least that means that you can squeeze out the sauce, and always get just the right amount! I have to add here that I actually prefer that you’re getting three smaller bottles instead of a huge one. This just means that you can shelf the sauces longer, which is better for people who only eat this on occasion, and wind up wasting the larger bottles. 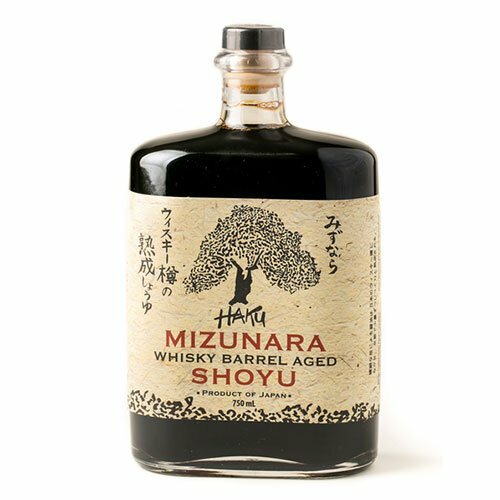 This is a 2-year old Shoyu, which was additionally aged for 13 months in barrels made from Japanese Oak – Mizunara. Hence the name. It has a mellow flavour, and it is slightly sweet, even though its sodium content is through the roof. This Shoyu actually contains 970 milligrams of sodium per serving, which is pretty much standard for soy sauce. It comes in a whiskey bottle with a cork, and I think that the packaging is a really nice touch. It also has a plastic cap that covers the cork, which prolongs its shelf-life. However, it’s not as convenient for serving, since the throat of the bottle is pretty narrow, and you will need to apply force to get the sauce out. This isn’t an all-purpose soy sauce, keep that in mind. It’s not really that great for cooking food in it – it’s meant to be used as a condiment. And it goes great with steaks and sushi, even vegetables – basically, as long as you dip food in this Shoyu, it will taste great. It is somewhat pricey, but you get a huge bottle – around 25.4 ounces. There are actually two types of soy sauce to choose from here – regular and dark. And both of them come with a side of star anise and peppercorn, which can really help you get into Asian cuisine! The dark sauce is completely vegan and doesn’t contain any added preservatives. Also, you can use it for cooking – it’s actually a great addition to any noodle soup, ribs or just a stir-fry. The light sauce, on the other hand does contain some preservatives and it’s not fully organic. But it is vegan. It has a milder flavor, and it can be used in several different ways – it’s great for marinating, cooking but also for dipping. It goes great with shrimp, chicken and even burgers! It is a bit pricey for soy sauce, but since it comes with a few spices, I think the price is okay. Especially considering the quality and the size of the bottles – 16.9 oz of soy sauce can really last you a long time. The best Shoyu would have to be the Kishibori Shoyu. It is traditionally brewed, meaning that it takes a lot of manual labor to make this product. But that also guarantees that you’re getting amazing flavour, and basically an authentic product. Plus, because it is traditionally produced with natural ingredients, it has a ton of health-benefits, including antioxidant and anticancer properties. 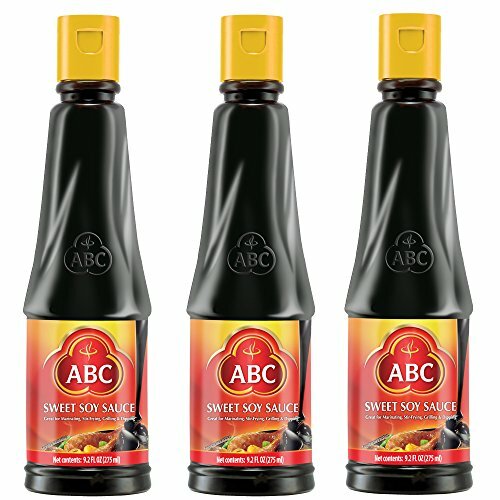 If you want the best soy sauce to use in sweeter dishes, go for the ABC Sweet Soy Sauce. It has a mild flavour, and it’s great for enhancing the favor of your favorite spicy and sour foods. Plus it comes in a pack of three medium-sized bottles, which makes it super easy to store – both in the fridge and the pantry. 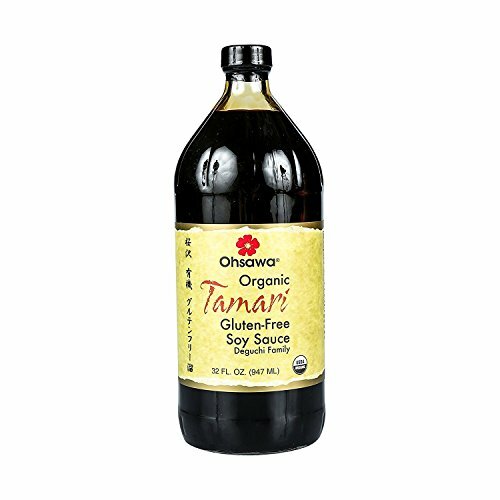 The best gluten-free soy sauce would be the Ohsawa Gluten-Free Tamari Sauce. And it’s not just gluten-free – it is also organic, vegan and has a low sodium content. It’s basically the healthiest option, but without sacrificing the delicious flavour. This is Tamari soy sauce, so it’s not the ideal option for cooking. Instead, it should be used as a condiment, and it is especially great with sushi! I really hope you learned something new today, and that I actually helped you find the soy sauce you wanted. Head over to Amazon to check out the prices of these options, and have fun tasting them!